Consumer behaviour is a complex process which behavioural economics is now helping us to better understand. However, most marketing theory about consumer behaviour is based around simplified models which are increasingly being shown up as not fit for purpose. As a result a number of myths have grown up about consumer behaviour and decision making that we can now dispel. 1. Prices are determined by supply & demand! Despite what economist might tell us, prices are often not the result of an equilibrium between supply and demand. When a new product is launched the initial price can be fairly arbitrary. It may simply reflect what the seller believes customers will be prepared to pay. However, experiments in behavioural economics show that the first price that we see when considering a purchase becomes imprinted in our mind and acts as an anchor. This influences not only current prices but also our future expectation of the price. This is contrary to traditional economic theory and is heavily influential on consumer behaviour. This phenomenon is called arbitrary coherence and explains why the first decision to purchase an item is so important to future consumer behaviour. It also suggests that what consumers are prepared to pay can easily be manipulated. Indeed, Dan Ariely found that the prices we are initially prepared to pay can be influenced by responses to random questions. In one experiment Ariely got students to write down the last two digits of their social security number before asking them to bid for a number of items in an auction. When the bids were analysed Ariely found that students with the highest-ending social security numbers bid the highest, and those with the lowest-ending numbers bid the least. Ariely’s experiments also demonstrated that once people are willing to pay a certain price for one product in a category, their expectation of prices for other products in the same category are logically linked to that first price (the anchor). This has major implications for how to influence consumer behaviour. 2. Consumer decision making is a rational and linear process. This idea is often expressed by the A.I.D.A (Attention, Interest, Desire, Action) advertising model which is still widely used to explain consumer behaviour. 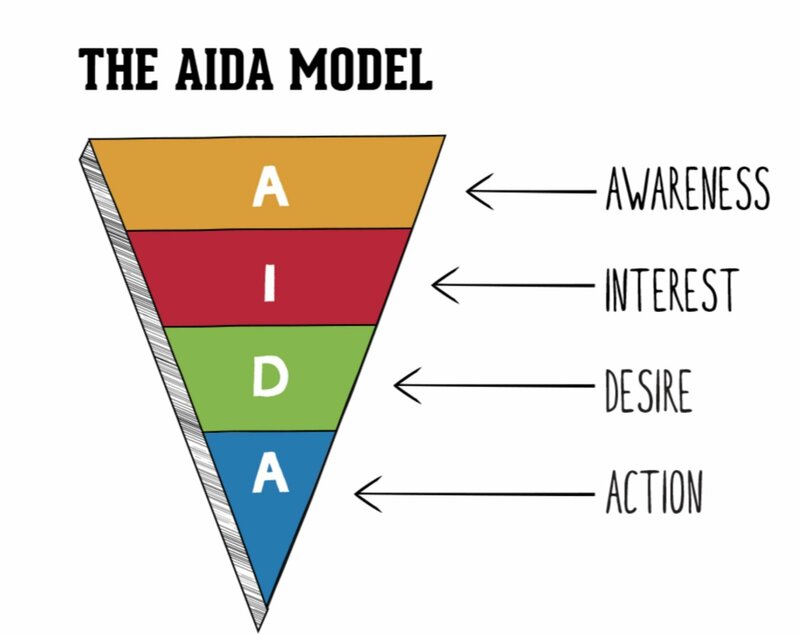 Many blog posts for instance refer to the sales funnel which is often an amended version of AIDA. However, experiments by behavioural economists (BE) suggest that most consumer behaviour is much more complex than this. Decision making is driven subconsciously by implicit (psychological) goals, whilst social norms and peer behaviour have a strong pull on our decisions. The context, including the environment we find ourselves in, and cognitive biases are also strong drivers of consumer behaviour. BE indicates that we then unconsciously review and post-rationalise after the event. This means that we usually act before we consciously consider our decisions and our memory of what drives our decisions is unreliable and often wrong. Because most of our decisions are driven by the unconscious mind we cannot assume that customer behaviour is a linear process as many popular models would have us believe. Mark Earls suggest that it is more likely to be similar to a game of snakes and ladders. Positive influences, such as what we hear from our peers, nudge us towards a purchase. However, negative influences, such as our emotional state, may move us away from a decision. 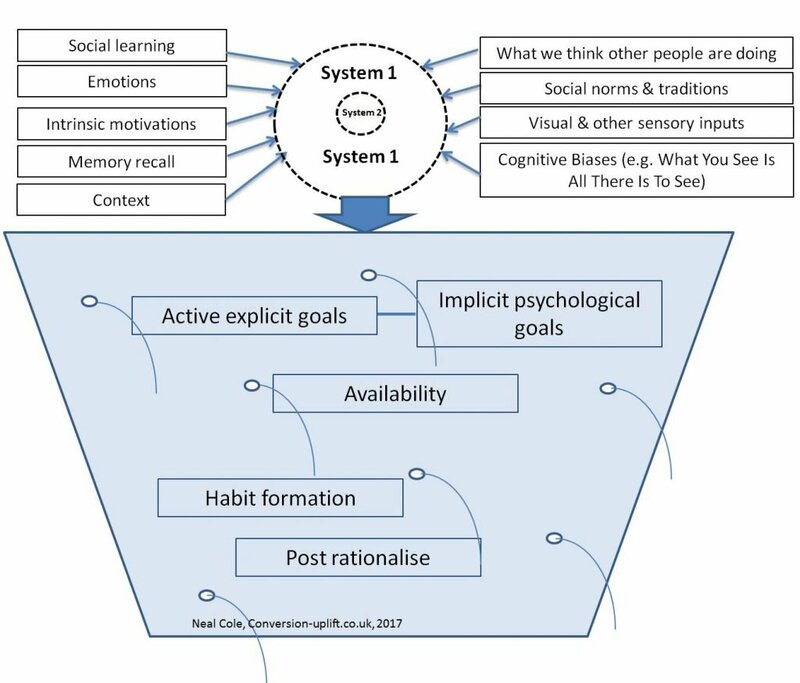 In the model below consumer behaviour is described more like a leaking bucket than a funnel as people are dropping out of the process all of the time. The model highlights how complex human behaviour is and that few, if any, decisions are made in isolation of what is going on around us. Because our brains are constantly being bombarded by stimuli much of the noise is filtered out by our mind and most of the time we rely on System 1 to make fast, intuitive decisions. 3. People have clear preferences and know what they want! As Dan Ariely points out in his book Predictably Irrational, “everything is relative”. People often don’t know what they want until they see it in context. Priming, anchoring, and framing are key to consumer behaviour when it comes to decision making. People like to compare things that are easily comparable, and the context of how we present items heavily skews our response to them. This is why it is particularly important how we position new ideas or products. For once we have presented something new as being positioned in a certain category (see category bias) it is very difficult for people to accept much movement away from this initial anchor. This partly explains why asking people about future purchase intentions can be highly misleading. The answers you receive will be strongly influenced by the context of the survey and the individual question. Further, as people are often not fully aware of their psychological motivations for past purchases you can’t expect them to predict how they will respond in a future hypothetical situation. 4. Consumers act independently of each other and express their individual preferences. Humans are a “super social species” (Mark Earls, Herd) and so consumer behaviour is often unconsciously influenced by what other people do or what we think they are doing. When faced with uncertainty we look to how other people behave and will often follow their lead (see Herd Instinct). Indeed, Mark Earls argues that human-to-human interactions about a brand are much more influential than business-to-consumer interactions can ever be. Further, he suggests that consumer generated word of mouth (WoM) is much more powerful than that created through marketing WoM campaigns. This is because people are very good at spotting cheating and deception. The insight here is that brands are built on interactions between people and not brand values or brand footprints. Whether it is consumer-to-consumer interactions or staff to consumer conversations, its people that matter most when it comes to consumer behaviour. Marketing departments may be more productive if they encourage C2C interactions rather than trying to control brand communications. There is some evidence to suggest that the C2C interactions potentially generate greater returns than short-term B2C marketing activities. This challenges current thinking about targeting and the Customer Relationship Marketing (CRM) approach to influencing consumer behaviour. If B2C communications are indeed more short-term and less powerful than C2C interactions then does this undermine some of the expected benefits from CRM? Certainly recent research does not suggest that most customers want a relationship with your brand! If this is the case then they key to unlocking the power of WoM may be more about giving power back to your customers to allow them to interact rather than trying to police brand communications.